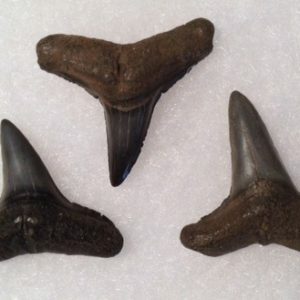 Jewelry-grade Tiger shark (Galeocerdo cuvier)teeth from the Peace River in Fla. Average size 7/8″ – 1″. These teeth are the highest grade and suitable for artwork or necklaces. 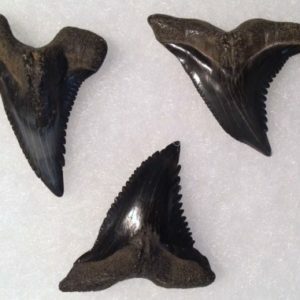 Jewelry-grade Fossil Lemon shark (Negaprion brevirostris) teeth. Average size 1″, from the Peace River in Fla. 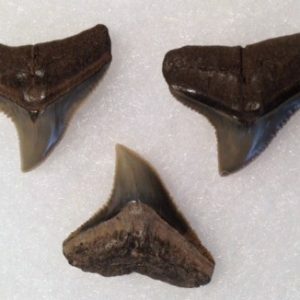 These Lemon shark teeth are as big as they get, all in the highest grade. Suitable for jewelry or artwork, etc. Postage included in USA. 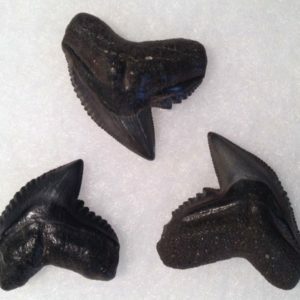 Jewelry-grade fossil Dusky shark (Carcharinus obscurus) teeth from the Peace River in Fla. Suitable for necklaces or artwork, these are the highest grade teeth. Average size 7/8″- 1″. Shipping included in USA.